The strange lights intensify and reveals the Mystery Men’s aircraft. As the ship flies over the ruins, its instruments and controls go haywire, causing a few of the nervous heroes to parachute out. Mr. Furious, Bondoman and the Flaming Carrot use manual override and regain control of the ship before it crashes. The team decides to land the plane near the campsite of the missing researchers. The Turtles, Colonel Blade and Professor Daub are alarmed by the sudden appearance of the airplane and make plans to hide, since they don’t know who’s aboard. The Mystery Men land and get out to investigate. As the Shovelor searches the jungle, Raph decides to attack him. In the fight, Raph launches himself at the man, who dodges. Raphael hurtles through some brush and over a cliff – where Screwball breaks his fall. Both heroes are freaked out by the sight of one another and flee from one another. The rest of the Mystery Men spot the Green Fire off in the distance, while Donatello battles Msytic Hand. Blade runs into Star Shark, but a truce is quickly formed as both realize that they’re all Americans. Raph stumbles upon the Mystery Men’s plane, and is met by Mr. Furious and the Zeke’s, who menace the Turtle with machine guns. 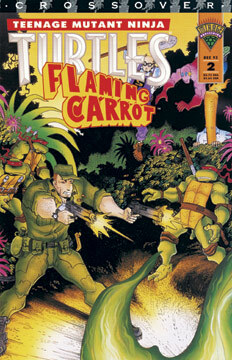 The Flaming Carrot arrives and admonishes his teammates for not recognizing a member of the TMNT. Raph explains about the Green Fire and soon enough both groups are working together. Later at their campsite, the heroes decide to light a bonfire to attract the Green Fire and use everything at their disposal to defeat them. Soon enough, thousands of Green Fire creatures erupt from the jungle. Raph grabs a flame thrower (to fight fire with fire) and blasts a group of the bizarre beasties – but the burst ends up empowering the creatures, who form into one gigantic Green Fire monster. Mr. Furious quickly shoots it in its weak spot (the dark circle on its chest), and once again a Green Fire creature pops like a balloon. Continued in TMNT/Flaming Carrot Crossover #3.